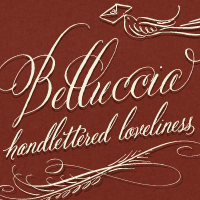 I previously posted about the creative ways the Trellis Collection by Envelopments used my cursive font, Belluccia. 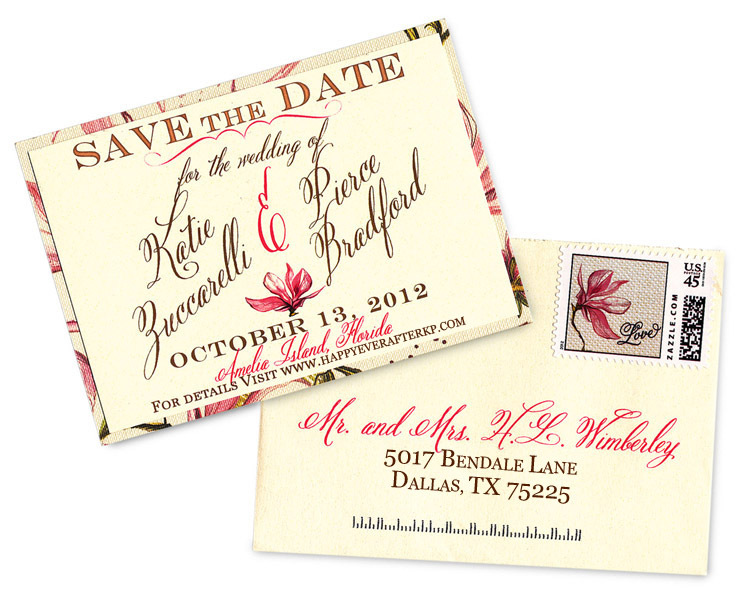 And here’s a perfect example of a Save the Date created for real life bride and groom Katie and Pierce. I just love the colors, layout and the way the names, in Belluccia, are angled and combined with the simpler block font. The envelope uses the same two fonts and gorgeous color with matching stamp to boot. This combo creates a good balance between the flourished lines of the calligraphy font with the simpler lines of the block style. This coordinated set was created by Samantha at Papyrus in Willowbend Mall in Plano, Texas. Check out the whole Trellis Collection for more clever ideas. All the best to the future Mr. and Mrs. Bradford! Debi, thank you so much for posting this! I am a HUGE fan of your font and I cannot wait for you to see what the full invitation will look like. I feel like a backup singer who gets to sing with Aretha Franklin when I use Belluccia. 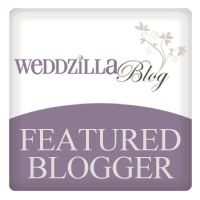 So glad to see you have a beautiful blog. The kudos is for you, madame! Thanks for your sweet words. Please send me some pics of the full invitation so I can post that as well. It’s really exciting to see how people use Belluccia. I’m busily working on the next font which I hope to release in the late summer or early fall. I’ll keep you posted!